LIVEWIRE provides a comprehensive suite of kiosk software to secure your remote kiosk systems, digital signs, and mobile apps. 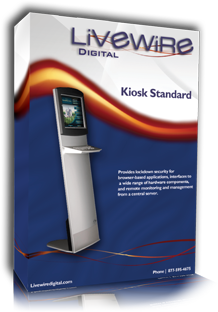 The kiosk software standard client runs locally on the machine to secure the kiosks and communicate with the Enterprise Server Console. The two components work together to generate usage reports, send heartbeats to remotely monitor multiple kiosks, and push content and software updates out to groups of kiosks, digital signs, and mobile apps. This software contains the Configuration Tool, which you configure to set the User Interface.